Former Premier League referee Dermot Gallagher praised Wednesday night’s officials for the way they handled the Eden Hazard incident at Swansea, insisting the Chelsea midfielder has “no defence”. Gallagher continued: “There’s no defence for that. Someone said it was borne out of frustration but you have to accept it. I don’t want to see it again. “It was an extreme but you can’t have that at a football match. It’s been addressed – and the action which has been taken is strong and correct. The 55-year-old, who retired from top flight action in 2007, explained on Sky News: “Chris had the power to go to the stewards and get a ball boy removed – and add on time. “But the people who look after ball boys are very, very good. 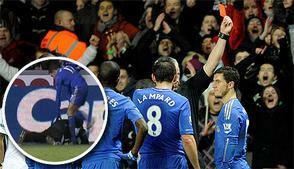 They are spoken to before each game by each individual referee, who will say ‘if we have a problem, we can address it’.